The RBA continues to be on hold. Their comments at the April meeting suggest that rates aren’t going anywhere anytime soon. 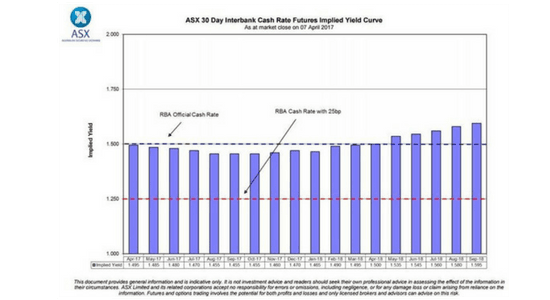 The cash rate futures currently show around a 38% chance of a 25bps rate hike in September 2018. 10-year government bond yields increased (bonds sold off) in the last quarter of 2016. This was largely due to the US election results and the potential of President Trump’s policies to cause US inflationary pressure. However in March we saw credit spreads tighten and bond yields fall (prices rallied). Again this was largely due to global geopolitical headwinds, such as elections in Europe, Brexit, Syria and Trump not being supported by his own party in getting his election promises passed. 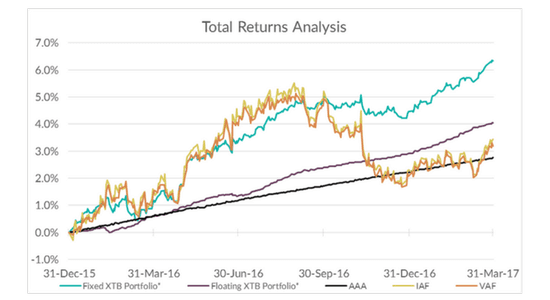 XTBs continue to outperform index bond funds on a rolling 1-year basis. 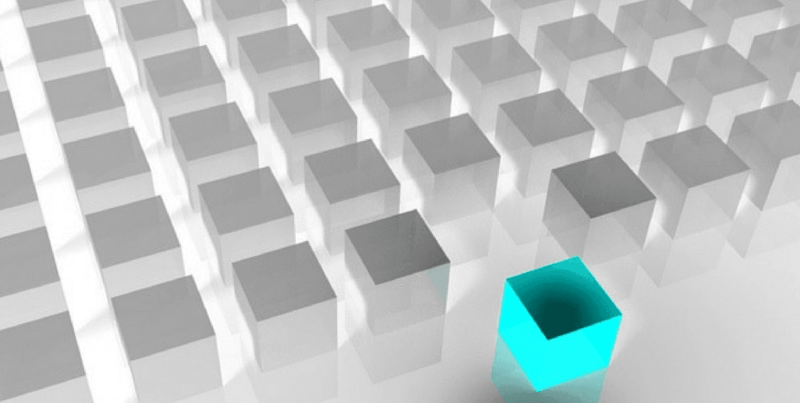 XTBs provide access to individual corporate bond exposures from some of the top Australian companies. Their maturities ranging from 2017 to 2022. The feedback from most clients is that they are happy with shorter duration, up to 5 years. The Maturity Ladder has been the most traded portfolio, as it has one XTB maturing each year from 2018 to 2022. This means that your clients have 20% of their portfolio maturing each year to reinvest at whatever the interest rate curve is at that time. 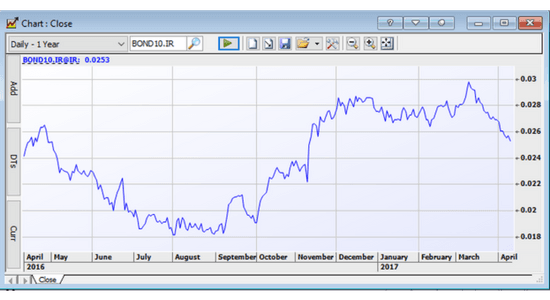 Yield to maturities range up to 4.17% as at 18 April 2017. IAF and VAF track the Bloomberg AusBond Composite 0+ Year Index which is made up of around 90% of Government related bonds with the other 10% mainly corporate bonds. As IAF and VAF are an ETF, unlike XTBs, there is no defined maturity date. This means you don’t have the ability to tell your client what income they will receive, or how much of their capital they will receive at a particular point in time in the future. This issuance (and others) meant the average weighted maturity of the Bloomberg AusBond Composite 0+ Year index increased in the first quarter 2017 from 5.77 years to 5.96 years. The modified duration also increased from 4.92 to 5. The average weighted yield to maturity of the bond index is currently around 2.42%, before fees. The chart below shows the returns of all Fixed-Rate XTBs, all Floating-Rate XTBs, IAF, VAF and AAA from the 1st April 2016 to 1st April 2017. Pricing data used to determine the returns in ASX ETFs is taken using the last trade price on the day and not the NAV. We have assumed reinvestment of distributions as at payment date unit price. We have set up a number of Model Portfolios for advisers and have four Starter Portfolios for retail clients. For more details on the available Model Portfolios or client cash flows for SOAs, please contact our sales team. Retail investors can find more information on Starter Portfolios here.